Which was the highest rank in the Aztec army? Why would a Catholic priest build an Aztec pyramid? See what we did on our first visit to a school! Click to see the latest Artefact in the Spotlight! Did the Aztecs invent anything that we still use today? asked Sheringdale Primary School. Read what Dr. Anastasia Kalyuta had to say. Feathers from which birds went to make Aztec & Maya headdresses? How did Mesoamericans envision the cosmos? Oldest school book on the Aztecs? When the Spanish reached the New World they were amazed at the diversity of rituals practised by the native peoples they encountered. Above all, it was human sacrifice that most drew their attention. Conquistadors, chroniclers and friars all documented the sacrifice of victims in different geographical areas of the American continent. Thanks to their writings we know something of how and when these rituals took place. However, some of these accounts were intended to fire up debate on and highlight the phenomenon of sacrifice in order to justify the mistreatment meted out to the indigenous population. For instance, the fiercely controversial Valladolid debate (1550 to 1551) represented two extreme positions, taken by Fray Bartolomé de Las Casas and the lawyer and theologian Juan Ginés de Sepúlveda (pic 1). The former was opposed to the encomienda* system and sought to liberate the natives from all forms of enforced servitude; Sepúlveda, on the other hand, wanted to justify the Spanish conquest of native peoples. To defend their positions, both focused on the subject of human sacrifice, and in particular as practised by the Mexica. 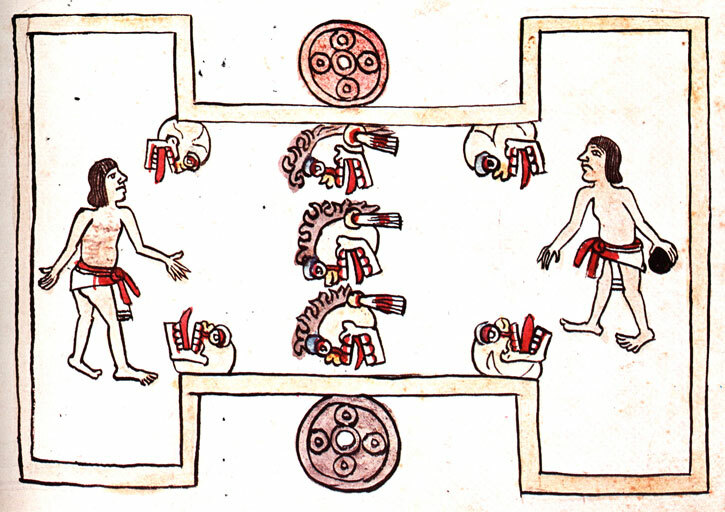 Las Casas argued that the practise had existed in many different societies throughout human history. Sepúlveda, on the other hand, who had never travelled to the New World, centred his argument on the numbers of people sacrificed each year. According to him, more individuals had perished through sacrifice than in war. In this sense Sepúlveda justified the Conquest, without taking account of the harm and destruction it had wrought on the local population. As a result, the 16th century saw the outbreak of a war of contradictory figures – some of which have been uncritically quoted to this day. For example, some writers today are happy to accept as valid the numbers given by Fray Diego de Durán, who claimed that during the inauguration of the Templo Mayor under the emperor Ahuitzotl a total of 80,400 individuals were sacrificed. Quite apart from the fact that we lack the archaeological evidence for this, a city such as Tenochtitlan with a population of some 250,000 inhabitants simply lacked the infrastructure and capacity to control, let alone sacrifice, that number in a single celebration. 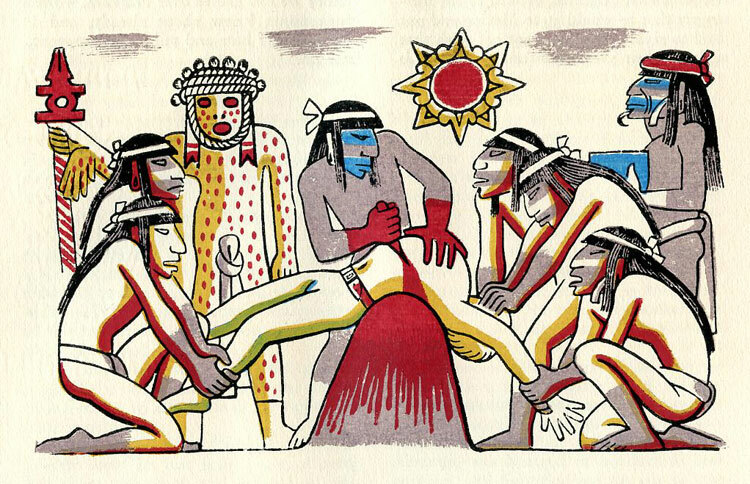 After so many centuries, the same question stands: Did Mexica sacrifices take place on the massive scale claimed by some Conquistadors and friars? 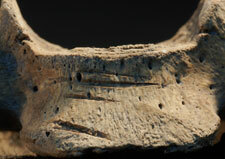 Thanks to archaeological excavations we can begin to answer this, based on evidence from bone analysis. 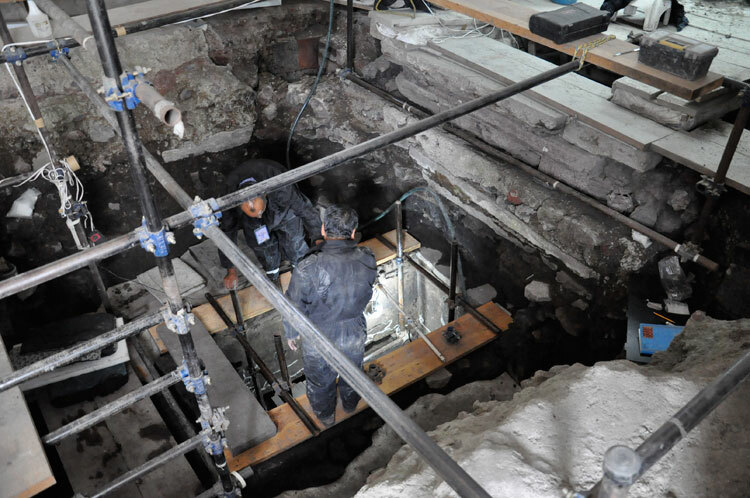 Through work carried out by the Templo Mayor Project and by the Urban Archaeology Programme (UAP), the remains of human bone fragments from different parts of the sacred precinct of Tenochtitlan have been recovered. Analysis of these shows that the vast majority relate to sacrificial victims whose bodies were posthumously used and disposed of after their deaths. 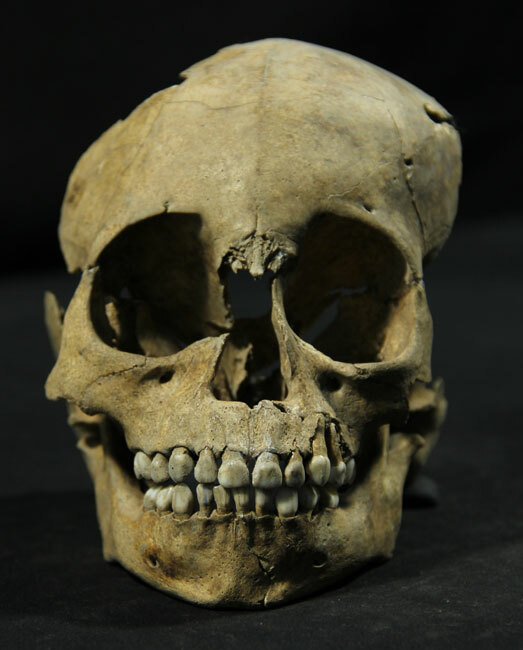 Amongst them were found men, women and children, almost all of them outsiders who had lived a number of years in Tenochtitlan before being sacrificed; this has been corroborated by the isotope and gene studies carried out by Alan Barrera, Diana Moreiras and Diana Bustos. The victims had been sacrificed in ceremonies that took place both at certain key times of every year, as well as on special occasions. The former related to festivals in the ritual calendar, the latter to funerals, inaugurations, coronations, or periods of drought. Depending on the occasion, either a bought slave or a captive warrior would be chosen for sacrifice. Individuals died through extraction of the heart (pic 4), slaughter or starvation, the first of these being much the most common procedure, according to historical sources. Possibly falling off a rock or being shot with an arrow were used as forms of torture preceding sacrifice, though they could equally well have been used simply to terminate the individuals’ lives. The inert corpses were subjected to different posthumous treatments, such as flaying of the skin, dismemberment, de-fleshing and decapitation; this last being the most prominent. The writings of the friars Toribio Benavente (Motolinía), Bartolomé de Las Casas and Bernardino de Sahagún agree that, following decapitation, victims’ heads remained in the sacred precinct, whereas the bodies were distributed amongst calpulli (neighbourhoods) or were thrown into the whirlpool at Pantitlán (in the lake). Archaeological evidence would confirm the ritual utilisation of the heads, being the part of the body most commonly found amongst the bone remains recovered in the excavations at the sacred precinct. Thanks to direct analysis of the bones we know that individuals were decapitated by the breaking up of the neck vertebrae, by a cutting blow delivered from front to back, using stone implements that left both sharp and blunt marks on the bone surface (pic 5). Some heads were buried immediately in the Templo Mayor, without undergoing posthumous treatments, as in the case of offerings made for the consecration of the building. 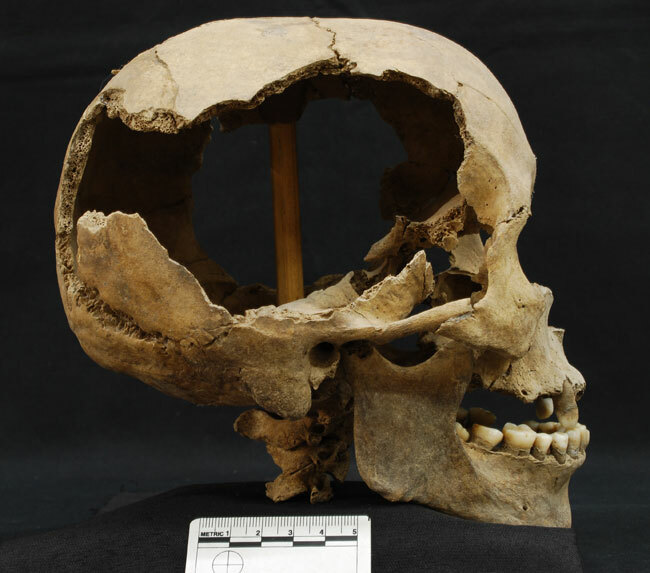 However we know that following decapitation most individuals were de-fleshed (partially or totally) with the aim of obtaining a skeletal form and aspect. Archaeological finds demonstrate that skulls were perforated from the side via heavy blows, so that they could be strung up along wooden beams and suspended on skull enclosures; this reflected the expansionist force of the State, yet it was also a symbol of fertility and of death, in the manner of a gourd tree (see pic 6). 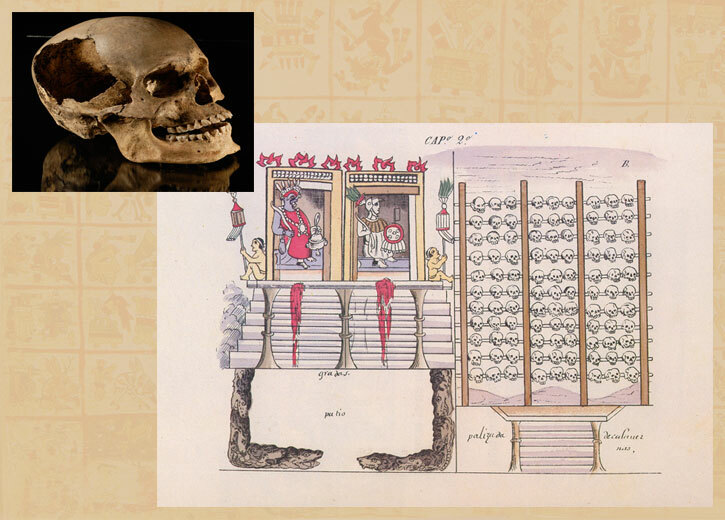 The discovery of the most important skull enclosure at Tenochtitlan, the Huei Tzompantli (Great Skull Rack) has allowed us to understand what post-sacrifice treatments entailed as well as the scope of human sacrifice itself. During work carried out between February and June 2015 by the UAP at Guatemala Street no. 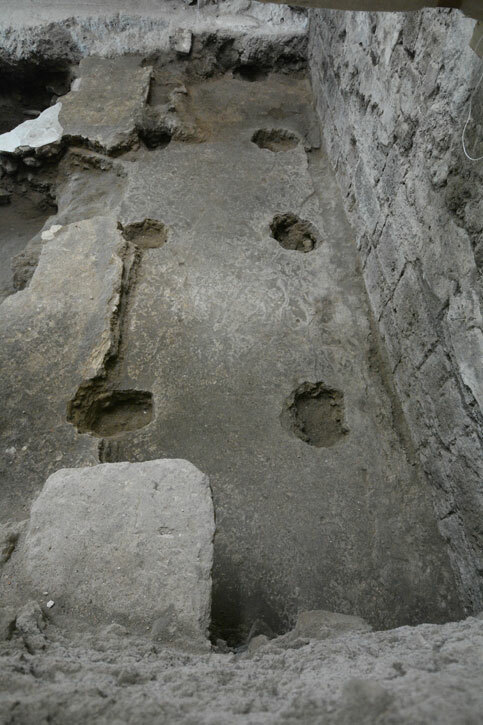 24, at the back of the Metropolitan Cathedral, the team under the direction of Raúl Barrera found the remains of this construction, aligned with the temple of Huitzilopochtli. It consists of a platform barely 60 cm. 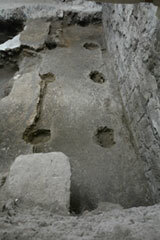 in height, its surface bearing the marks of holes into which stakes were driven, to which were fitted the beams that held the perforated skulls; even though only the northeastern corner of the platform as so far been excavated its length has been estimated at roughly 35m., running from north to south (pic 7). 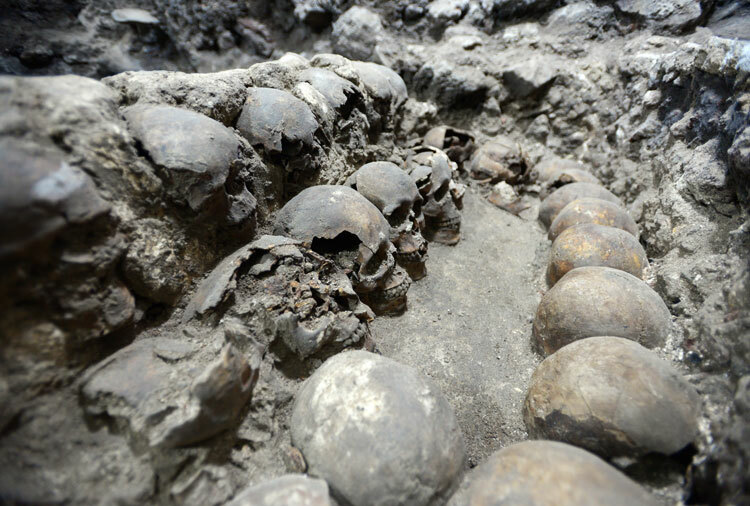 During the excavation of the Huei Tzompantli the team of archaeologists made an unprecedented discovery: a tower attached to the building, built entirely with human skulls cemented together with lime, sand and clay mortar (pic 8). 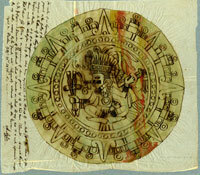 Whilst incomplete, this structure fits the descriptions of Andrés de Tapia, an eye witness at the time. The Conquistador states that ‘reaching from one end of these beams to the other there were two towers made of lime and skulls, without any other stones, and with the teeth facing outwards.’ Archaeological data show that the skulls on the front of the tower were indeed placed facing outwards, just as Tapia describes. 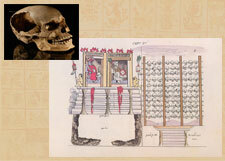 What the Conquistador could not see is that in the centre of the structure the skulls all faced inwards (pic 9). As in other edifices, the towers of the Huei Tzompantli consisted of several building stages, of which only two have survived; the oldest measuring 3.6m. in diameter and the second 4.7m. These remains were invisible to the Spanish, being buried under the surface. In contrast, the tower in use at the time of the invasion was destroyed, its dimensions lost. To date, physical anthropologists from the UAP have been able clearly to identify young men, though women and children were also present (pic 10). Archaeological work in different areas of the sacred precinct show us that this skull enclosure was a dynamic structure, where skulls were displayed and then subsequently removed. Some stayed a considerable time on the skull rack, exposure to the elements leading to their fracturing. Others were removed speedily, allowing even articulated vertebrae and jaws to be preserved (pic 11). The majority of skulls were incorporated into the towers, making these true repositories in which the heads of individuals were stored. In contrast, other skulls were re-used. Of these we have to date counted 34, all of which were removed from the enclosure in order to be modified, transforming their function and symbolism. Ten of these were appliquéd, painted and had blades attached to them, to create effigies of gods to be placed inside the offering boxes of the Templo Mayor. The rest had their backs removed, in order to make so-called skull masks (pic 12). 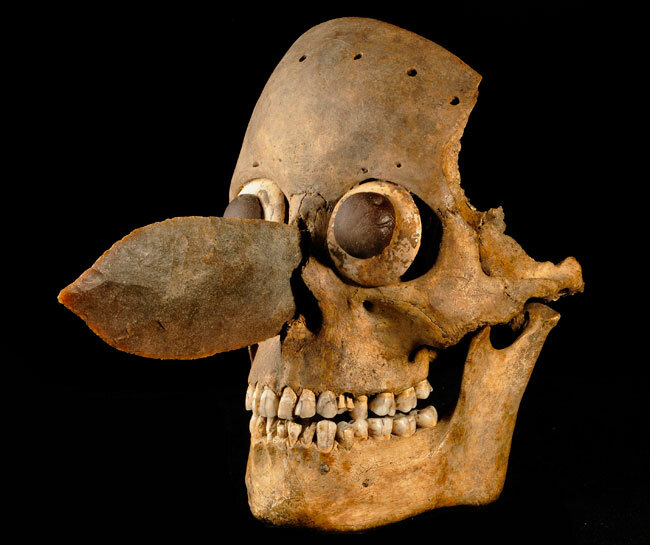 Despite this popular term they were not proper masks, as they had the eyes and nasal cavity covered. From information in pre-Hispanic and colonial codices, and on Mexica sculpture, we can conjecture that some of these ritual objects would have been used as attire for deity images and as priests’ finery, or they might have been displayed in other religious buildings. 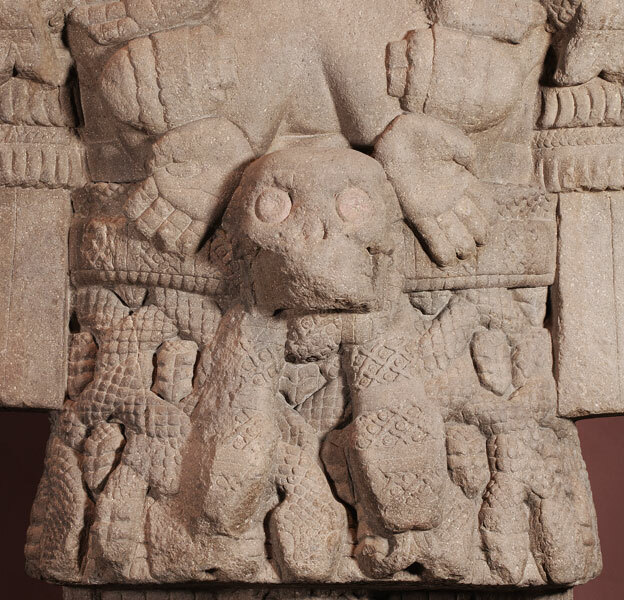 A propos, we can reference the Coatlicue goddess monolith, a sculpture of unequalled quality, in which the Skirt of Serpents Goddess bears on her necklace two skulls with their backs removed and bearing circular eyes similar to the adornments on the skull masks (pic 13). Pictographs clearly show these ritual objects displayed in other settings, such as ritual ballgame courts (pic 14). 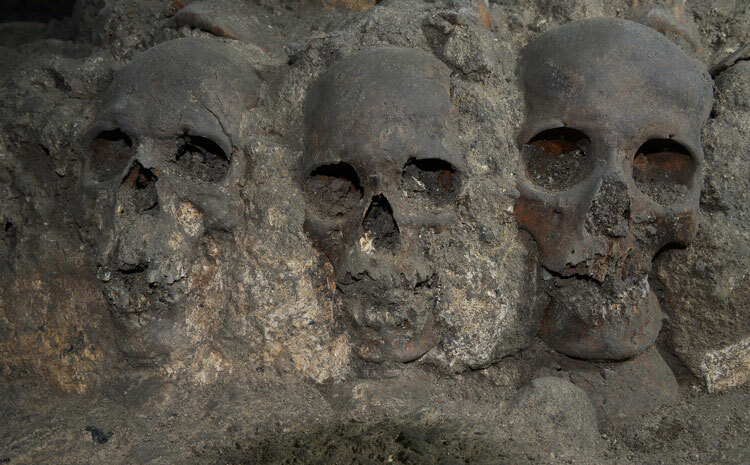 Whilst possibly put to use in these contexts, we know these de-fleshed skulls ended up deposited in offering caches in the Templo Mayor, representing deity effigies. The majority relate to the lord of the underworld Mictlantecuhtli, though other deities were also represented, as in the case of the goddess Cihuacóatl, identified by researchers Erika Robles Cortés and Alejandra Aguirre Molina by studying the traces of paint found on the sculpture. Most of the evidence of human sacrifice in Tenochtitlan is not to be found in the Templo Mayor - a building never conceived of as the burying place for sacrificial victims. 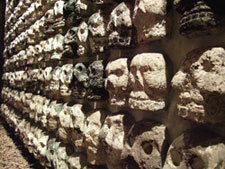 Instead, the majority of human remains were preserved in the western plaza and in several buildings leading off it. The Huei Tzompantli is a veritable funerary centre of gravity, preserving the bulk of the evidence. To date, the UAP team have counted some 450 skulls which, along with finds in other areas of the sacred precinct, give a total of approximately 1,000 individuals. We know we will never find the bones of all the victims of human sacrifice, given the challenges and limitations of archaeology in urban centres. Even so, thanks to these finds we can prove both the existence of human sacrifice and the fact that Spanish sources exaggerated the numbers of people sacrificed in Tenochtitlan. Nevertheless, apart from allowing us to re-assess the figures for human sacrifice, the importance of these finds lies in their providing us with a pathway to a greater understanding of the complexity of ritual practices in Tenochtitlan, and of the obtaining of war captives and bought slaves. As for forthcoming research in this area, the future is promising, in the form of new data yet to be revealed by a new generation of archaeologists and physical anthropologists. • Pic 13: photo by Boris de Swan, courtesy of Editorial Races.